Did you know that the average male’s handicap in America is a 16.1? For women, it is 28.9. Did you know that only rounds played during the April 1 to October 31 designated “Golf season” can be included in determining WSGA handicaps in the state of Wisconsin? 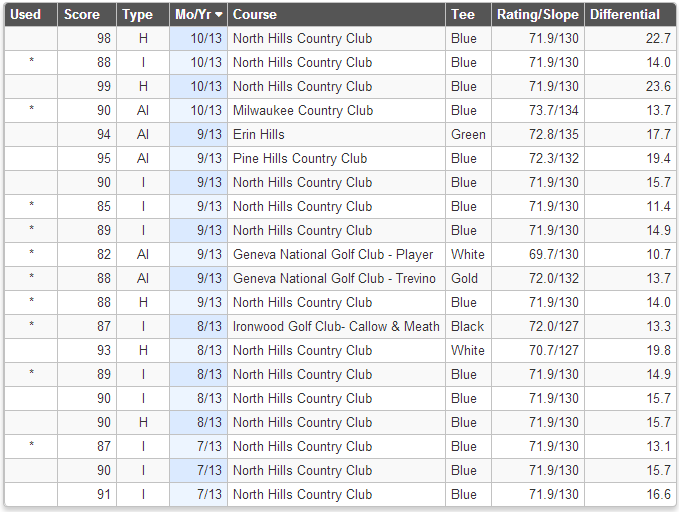 I finished last season with a WSGA index of 12.8, and my goal for 2014 is to get under 10. Ideally, I’d like to be around a 7 or 8, but obviously will have to find a way to be much more consistent off the tee. 12.8 index – can’t wait to start whittling this down! This winter already seems like it’s been really long, but word is we’ll get in to the high 30’s later this week, and possibly the 40’s by next weekend. Hopefully we’ll actually be able to play by April 1 this year… Fingers crossed!